When a Kaneohe family were preparing for a complete knock down and rebuild home project, they knew that they would need to bring in the big guns for the kitchen remodel. They headed straight for the local BIA home show, which brings together Hawaii's best home and kitchen remodel pros and potential clients together. A fully updated kitchen was part of this complete teardown and rebuild. Jessica Omoto, a lead designer for the one-stop shop home remodeler Homeowner’s Design Center (HDC), shares with us about how their initial meeting with the homeowners went. 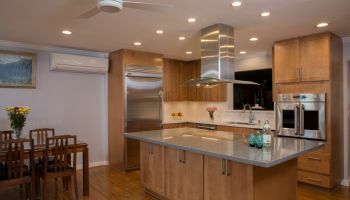 “They found us at the BIA home show, where we talked with them a little bit and then they actually came back into the showroom with some blueprints and plans,” for their kitchen remodel. Needless to say, the homeowners had specific visions in mind (and literal plans!) for what they envisioned their new home, particularly their kitchen remodel, would be. It was now HDC’s task to help them achieve this vision. The homeowners had preplanned what their kitchen remodel would be. 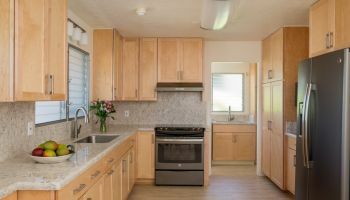 “They had the colors already picked for the countertops, so we actually worked from the countertop colors ‘backwards’ to match up the cabinetry and flooring, etc.,” Omoto explains of the kitchen remodel. Almost like completing a really beautiful and intricate puzzle, the company then went about “filling in the details,” finding the best, most aesthetically appealing and practical brands and features to complete this masterpiece kitchen. Color choices for the finishes were based on pre-selected countertops. The tile backsplash was selected to complement the Cambria countertops. The next step in the kitchen remodel was to choose the cabinetry. “They went with [Diamond brand] cherry wood, starting out with that rich, cherry red tone. Then, they added a cinnamon stain, so it really brought out that red richness of the cherry wood. It was a very nice complement to tie everything together.” A few unique glass panels were incorporated within the cabinets as well. Omoto explains how HDC even used an antique-inspired glass, really giving the panels that extra bit of character and charm for the kitchen remodel. Cherry wood with a cinnamon stain was used for the cabinets. The vinyl flooring, chosen by the couple, was then expertly incorporated, followed by the kitchen’s lighting, which features a trio of pendant lights, as well as lovely recessed lighting, under cabinet lights and even lights within the glass panel portions of the cabinets, which really serve to highlight the loveliness of that specific kitchen feature. The cabinets were going to serve as a focal point for this kitchen remodel. Vinyl flooring with pendant lights, recessed lights, under cabinet lights and interior cabinet lights helped to tie the room together. “The owners are just starting out their family, so they will have a lot of little ones running around and a heavy flow of traffic for the next 18 years!” Omoto says. This means that entertaining friends and loved ones, and a daily parade of kids and family, will require a suitable kitchen to match. The kitchen remodel had to provide for a lifestyle suited for a growing and active, young family. The same style of cabinets in the kitchen was used for the bathrooms. A few kitchen remodel features were incorporated that really behoove a young, growing and active family: a gorgeous and spacious island, complete with a large counter space and seating for dine-in options and modern appliances, including an impressive Kenmore double-oven, a Whirlpool hood, double sinks and a sleek, cooktop surface. When all was said and done, this kitchen remodel was clearly a success, resulting in a kitchen whose beauty, as LL Cool J and mama would say, is "Gonna knock you out." To see more kitchen remodel projects by Homeowners Design Center, just click on any of the photos above or wherever you see their name.